Nicos Kazantzakis was probably the greatest author to be born on the island of Crete. His books included Zorba the Greek to Freedom or Death. His book, The Last Temptation, was banned by the Pope and his writings in general led to him being excommunicated by the Greek Orthodox Church. He thus was not allowed to be buried in hallowed ground. He died in 1957 and his grave lies on top of the south bastion of the Venetian wall around the city of Iraklion. This was where he was born and spent a lot of his life. 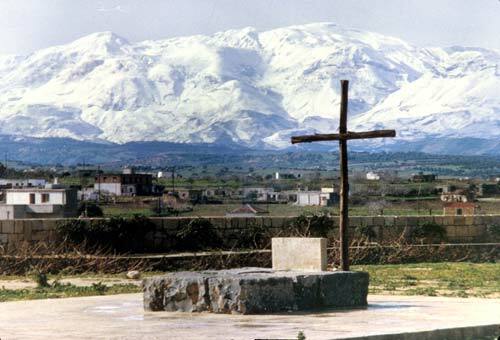 The final resting place of Nicos Kazantzakis. The road from Iraklion winds south through the town of Agia Barbara and descends to the Mesara Plain at a small village which is still called, to this day, Agioi Deka. Agioi Deka is built on the eastern part of the ancient city of Gortyn. Gortyn is one of my favourite sites in Crete and more will be written of this exciting city of Crete which was the capital for many centuries of Crete and north Africa. At the end of the second century AD, Christianity was spreading across Crete thanks to the earlier work of the Apostle Titus, a Cretan who was student to the Apostle Paul who landed on the island around 62AD. Titus became the Patron Saint of Crete and a huge Basilica with five aisles has now been discovered west of the centre of Gortyn near the village of Metropolis, which is called the church of St Titus. The old church of St Titus in the public area of the Gortyn site was not the original church by any means. It was just called that by an archeologist in the last century. By the end of the second century AD Christianity was an important religion in Gortyn. Circa 170 to 190AD Gortyn had a very active Christian bishop called Philip who is today held as a saint in the Roman Catholic church. Every day we learn more about these times in Crete but the information is still pretty scarce. At least until the year 249AD. Within the Roman Empire that year was a leader called Emperor Decius who was deified as were all Roman leaders. Decius though, wanted the whole of the Roman Empire to worship his name and this happened in Gortyn. A shrine was set up and a great celebration declared to worship the Emperor Decius, god of Rome. Although Gortyn was by now becoming a Christian city, no one argued with the Emperor of Rome. So everyone in Gortyn went through the motions watched by the Romans. All except ten men who used the moment to protest saying that no one should be worshipped except the true god, Jesus Christ. Consequently all ten were arrested. It is interesting though that this protest seemed to have been a planned protest. Although five of the men, Theodoulos, Satornilos, Euporos, Gelasios and Eunikianos came from Gortyn, the other five came from other cities such as: Pompios from Lebena, Agathapos from Panormos, Basiliedes from Kydonia (Hania), Zotikos from Knossos and Euarestos from Iraklion. The men were held in prison and tortured for one month. But they failed to change their opinions and so they were sentenced to death by the governor of Crete. The executions took place in Alonion, a part of Gortyn now known to be the main amphitheatre of Gortyn. Later in the reign of Constantine the Great of Eastern Rome now called Byzantium governed from Constantinopolis (Istanbul), permission was given to raise the bodies of the ten men, now sanctified as saints, and rebury them in holy ground in sarcophogi. No one knows exactly where they are buried for there is still so very much of Gortyn to discover. The graves of the martyrs of Alonion, Gortyn may be the sarcophogi discovered during a rescue excavation in 1981. There was a low enclosure where stone sarcophogi were seen at the centre of which was a small votive pit. The site was then recovered and is now, apparently, no longer accessible. We just don’t know. However the ten saints of Crete are still celebrated today for their courage and their sanctity and the previous centre of the amphitheatre Alonion now holds the church of the ten saints in the village of Agioi Deka, just south of the main road through the village. The church stands in the original oval of the centre of the amphitheatre and is dated to the late twelfth or early thirteenth century. It has a fine icon to the saints as well as wall paintings that depict the ten saints. It is well worth a look. It is also worth remembering that the ten saints came from cities in central and western Crete suggesting that even in the third century AD, Christianity had not yet penetrated the east of the island.